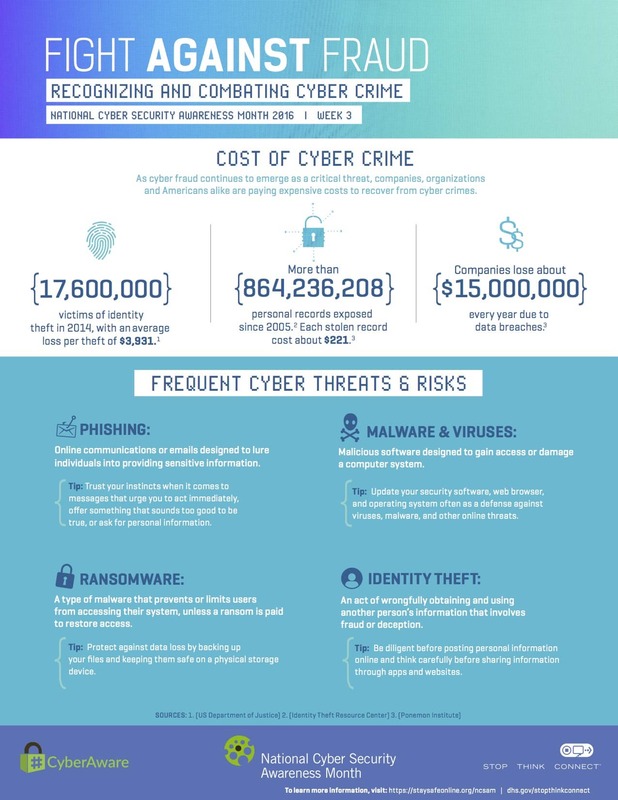 Week 3 of #CyberAware Month focuses on recognizing and combating cyber crime in our connected world. Learn more at http://ncsam.info/13o8jKO. Cyber crime takes many forms. Be sure to protect yourself and others by being cyber aware. Fighting cyber crime requires a collaboration of law enforcement, government agencies, private sector and general public. IdentityTheft.gov is a one-stop resource for reporting and recovering from ID theft. Fight cyber crime during #CyberAware Month by reporting scams using the BBB scam tracker: https://www.bbb.org/scamtracker/us/. The FBI IC3 accepts Internet crime complaints at https://www.ic3.gov/default.aspx. Don't be afraid to reach out! What are you doing to combat fraud and cybercrime?